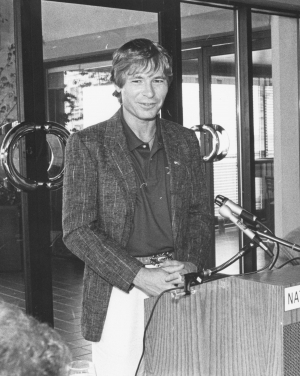 Singer, song-writer and activist John Denver discusses world hunger and environmental issues at a National Press Club Newsmaker event, Aug. 12, 1981. August 11, 1971: Joe Frazier appears at a National Press Club Luncheon not long after his successful defense of the world heavyweight title, defeating Muhammad Ali in the “Fight of the Century” at Madison Square Garden in New York City. August 12, 1981: Singer, song-writer and activist John Denver discusses world hunger and environmental issues at a Club Newsmaker event. Denver is one of many entertainers such as Harry Belafonte and Dolly Parton to appear at the Club over the years on behalf of human rights, literacy and other global-humanitarian issues. August 15, 2001: Stephen Ambrose, American historian and biographer, appears at an NPC Book Rap to talk about his latest book, The Wild Blue: The Men And Boys who flew the B-24s over Germany in 1944 and 1945. Known as “Uncle History,” Ambrose wrote more than 30 popular books about the Civil War, World War ll and other American  sagas, as well as biographies of former presidents Dwight David Eisenhower and Richard Nixon. This Week In National Press Club History is brought to you by the History & Heritage Committee, which seeks to revitalize and preserve the Club’s century-plus history with lobby displays, events, panel discussions and an extensive oral history project. For more information on the Committee’s activities or to join it, contact Chair Gilbert Klein at gilbert.klein@yahoo.com.